Clarence Oscarson holding two bags of onions and standing in front of the Old Trail Market. Ray and his aunts and uncle on the farm were able to make it because of the garden. While they had no money, they had veggies, a flock of chickens, a milk cow and usually a pig or two. They were truck farmers, growing vegetables to bring into town or to sell at the Old Trail Market, the roadside vegetable stand on the farm. This entry was posted in HISTORY and tagged old trail market, Probstfield Farm, Ray Gesell, The Great Depression, Truck Garden on April 15, 2013 by probstfield. the largest permaculture communities in the US, Earthhaven Ecovillage, is located in the nearby town of Black Mountain. Very interesting and so true. 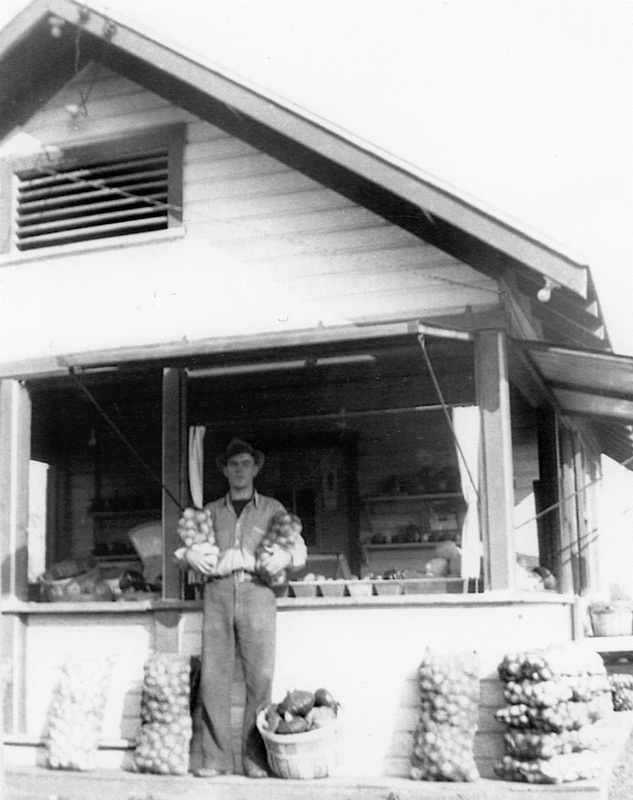 The photo however, is not of Ray Gesell but my father, Clarence Oscarson holding the onions in front of the Old Trail Gardens stand. Dad had been working at the Old Trail Market farm (now called Probstfield Farm) for several years while in high school. In fact, this is where his love of building started when he helped build the main barn. He told the owner, Ray Gesell, that he needed to earn more money so he wouldn’t be returning the next summer. Ray, knowing “Oscy” was a hard worker, offered Dad an acre of land where he could grow whatever he wanted and keep all the proceeds if he would just return to work in the summer of 1938. Dad agreed and planted onions on his acre. Dad enlisted his five sisters to help harvest and shared the money with them and his mother. Yes, this photo is definitely my father.